Ebola has been around since it’s discovery in 1976, so what makes this particular outbreak so different than previous, far smaller outbreaks? Many public health officials believe the problem could be related to cultural practices. People in DRC have had over 30 years to learn about Ebola, to learn not to touch the bodies after someone dies of a suspected Ebola case, and that burning the bodies is a more effective way to ensure the virus won’t spread. In Liberia and Sierra Leone, people still go through rituals after someone dies, which include washing the body, kissing it, cutting hair, shaving, etc. All of which hugely increase the chances of infection spreading. And you can’t just change an entire culture’s belief system overnight. Other possibilities for this unprecedented outbreak include the urbanisation of Africa in recent years, and the fact that the disease has reached Monrovia, Liberia’s capital, rather than being trapped in rural villages, which are easier to contain. However, that is not the only theory. In this BBC article, a virologist called Professor Ball suggests that the Ebola virus may have mutated and become less deadly. 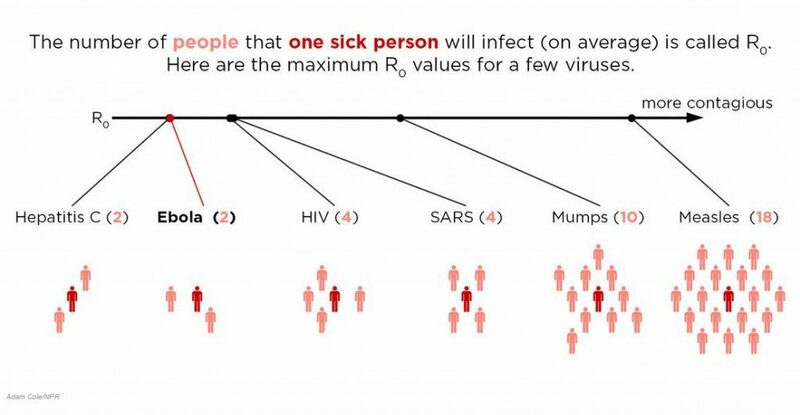 In other words, the less deadly a virus becomes, the greater the risk of spread. Previous outbreaks have been so deadly, and kill so fast, it doesn’t give the virus much time to spread and makes it easier to control. If it’s less deadly (and this strain is believed to kill only 50-60% of people infected), and there is a longer incubation period (up to 21 days) then there is much more scope for people to spread it around. Prof Ball suggests that if the death rate continues to reduce, the outbreak may become impossible to contain, as we have seen with a similar deadly virus spread through bodily fluids – more commonly known as HIV. This article makes a similar comparison to HIV/AIDS, and this fascinating interview with the man who discovered Ebola also concludes that the virus could well mutate – if it hasn’t already. Which begs the question – Can this really be stopped? Is it already too late? This brings me neatly to my second point. Poor old much-maligned MSF have been trying to warn the world about the dangers of Ebola for months now, and no-one listened. Their warnings went unheeded, as we were busy with terrorist cells, missing planes, elections, and other important global news. This really should not come as a surprise to any of you. Time and time again the aid sector has formed campaigns, carefully-planned media releases, and many other forms of early warnings which go unheeded until it is too late. Many people think this is purely for fundraising purposes, and while there is an element of truth to that (a crisis with no media coverage won’t get much funding, because no-one knows it’s happening), it’s not fair to assume that awareness-raising doesn’t have merit in it’s own right. Look at the vast improvements in people’s knowledge and awareness of climate change (although there is still a long way to go on that). It is slowly but surely changing people’s behaviour, the way we shop, the way we commute to work, the type of car we buy, etc. And yet early warnings rarely work. As Oxfam’s recent ad campaign for South Sudan highlighted, people just don’t care about a famine until it’s a famine. If you wait until people are dying of starvation, it will make the news, but trying to help people before they’re actually at that stage is a surprisingly hard sell. Not many people care about an almost-disaster. No-one reads about the earthquake that didn’t happen. By the time it’s declared a famine, it’s already too late, and the damage has been done. 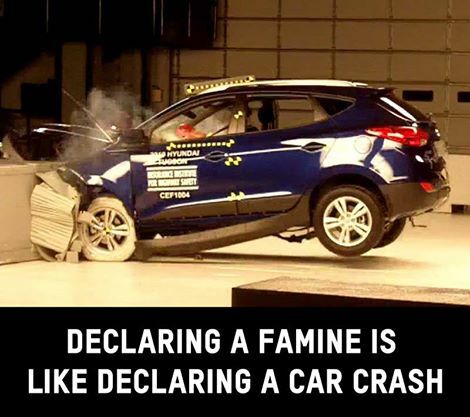 Source: Oxfam GB Declaring a famine is like declaring a car crash. Once it happens, it’s too late. South Sudan is not making headlines because the crisis hasn’t yet technically been declared a famine. But that’s no comfort to the millions of people there facing starvation. The fact that the rest of the world didn’t start to sit up and take notice of Ebola until American and European staff started to die, and cases were found in Spain and the US, is hardly a shock. This handy map tells you where Ebola has been detected so far, and as the numbers creep up, the levels of public panic increase. In the case of the US nurse who contracted it in the hospital, I can’t help but notice how quick the US government and CDC were to blame the nurse. She must have made a grave error, they proclaim, as the last thing they want is people panicking that Ebola is just that contagious. Now to be fair, they are also telling the truth – if she was wearing full protective gear at all times, then she must have made a mistake somewhere, as any expert in infectious diseases would tell you. But it seems a little harsh that they have so swiftly leapt to play the blame game and make her into the scapegoat. One doesn’t see the many other nurses and health workers in Spain, Liberia and Sierra Leone who have contracted the virus being treated the same way. For those 232 other health workers who died, it’s a sad tragedy. For the nurse in Texas, it’s her own fault she made a mistake. A cruel yet effective way to deflect public opinion and reassure a panicking population. As long as it was her own fault, then we’re all alright, we won’t get infected. You just keep thinking that America, and good luck to you. Of course, even while writing this blog post, I discover that a second nurse in the US has now been diagnosed with Ebola, and this time around the CDC and Government are both noticeably quiet on the reasons for Nurse #2’s infection. I am equally unsurprised to see that the Nurses’ Union are hitting back against the assumption that they are to blame. Good for them I say. Of course, there is plenty of misinformation out there, which doesn’t help, and while I personally trust the Beeb to tell me what’s what, who’s to say that the news you read is more or less trustworthy than the news I read? Or indeed, that if enough people tell you eating a raw onion will protect you from catching it, and a deadly disease is rampaging through your local town, how many of us wouldn’t munch on the odd onion just in case it helps? Of course, what with all the panic about it spreading to the US or the UK, and crisis talks on how to stem the spread of disease, and experts disagreeing on whether or not it is even possible to contain any more, people seem unaware that there are far worse consequences that could still occur. Professor Peter Piot, the man who discovered Ebola, talks about a far bigger threat to the world. 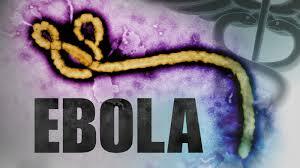 If it lands in the UK or US, we have the capacity to contain it swiftly and stop an outbreak. But what if the next case winds up in India? There’s about a billion people over there, and once can assume they don’t have the capacity to isolate and contain an outbreak. Imagine if those germs found their way to a slum in Mumbai, or Delhi. South Sudan, a country in the midst of a civil war, and on the verge of a famine. A country filled with weak, malnourished, starving people, crammed into IDP camps in close confinement. Walking barefoot through 12 inches of thick mud between tents, it’s not hard to imagine that an outbreak of ebola, with diarrhoea and vomit being washed out of a tent floor and into the mud, would be swiftly tracked through the camp and into every other tent on the soles of their feet. South Sudan, the world’s newest country, teetering on the edge of collapse, certainly doesn’t have the hospitals and equipment that India has, and even Liberia and Sierra Leone’s clinics are far better equipped in comparison. All it would take is one case to reach South Sudan, and the spread would be practically impossible to contain. In a country already so weak from hunger and malnourishment, Ebola could well have the capacity to wipe out half of the population. A truly chilling thought. So, aside from planning for the worst, what else is there to consider? I’m sure many of you are wondering why I might be considering going there, as I’m not a public health worker, I’m not a doctor or a nurse, in fact my speciality is in Food Security and Livelihoods. I was struck when I read this 13-year old’s account of Ebola, that people are being isolated where possible, but also contained, sometimes against their will within villages or areas. In an effort to stop the spread, people are being asked to observe curfews, and travel between towns and regions is restricted. This means that people can’t get to market to buy and sell their produce, they can’t leave the village to go to their farms to harvest their crops, they can’t buy food and essential items, which is all the more critical when members of your family are sick and dying, and you need to get them medicine, clothes, food, and other essential basic needs. National prices are already being affected, and an economic slowdown is predicted across several countries in the region. In Cote D’Ivoire, cocoa prices are already showing signs of fluctuation linked to the Ebola crisis, and one can assume that previously exported foodstuffs are unlikely to be in demand for a while. How many of you are likely to keep buying fruit, vegetables or chocolate imported from Liberia? In addition to all of this, with so many households losing the productive, working members of the family, their income will be drastically reduced as they struggle to make an income with fewer family members left. So while the immediate needs are certainly for public health staff (and in large numbers), and equipment, hospitals, doctors, information campaigns to help people understand how they might catch Ebola, the longer-term wider effects are not yet very visible, but they are there. As the markets start to shut down, as people grow less food and are unable to earn money, prices will start to become unstable, and long after this health crisis has gone (if it goes at all), the markets and economies are likely to remain unstable. And the sooner we can assess the needs, monitor food prices in the markets, get people vital food and cash into quarantined zones, the faster they will be able to recover when this nightmare finally ends. Since originally posting this, there have been some interesting updates. Both Senegal and Nigeria have been declared Ebola-free (2 x 21 days, allowing for the incubation period of potentially infected people and their contacts), and the first case has been confirmed in Mali. A case has also been confirmed in New York – the 4th case in the US since the outbreak began. This entry was posted in 2014 and tagged 2014, Ebola by worldenoughandtimeblog. Bookmark the permalink.